Makenzies Miracle: More Rolling Fun! Days like today are are great! We finally got to go to church again! It seems like there are so many things that have gotten in the way of that lately. In the last couple of weeks it has been sickness! We went out to lunch with my brother and sister in law after church and it was GREAT to catch up!!! It seems like I have just been bouncing from one project to the next!! Disney World (not really a project..can I go back tomorrow? ), Costa Rica, Home improvements, IEP meeting, and then NAPA Center! This summer has been way busier then I thought it would be but it was so worth it! The kids go back to school in a week and I can't wait! They are so bored! I am hoping to get in a couple of fun things this week in between all of Makenzie's therapies and my meetings! It is going to be another CRAZY week! Makenzie continues to do GREAT!! She is so loose and her flexion has greatly improved! She has also been rolling a ton! In fact today she rolled over just because 2 different times!!! The boys were behind her a she wanted to see what was going on!!!! This is GREAT on so many different levels! One because she is rolling! Plain and simple! Two because she is rolling with a purpose! She wants to see something. She is playing a game or I am calling her to come and see me! I am so proud of her!!!! I have been asked several times if I think it is the stem cells. I am not sure but what I do know is that she has worked on this for 2 years and always needed some kind of help. She is so much looser and able to relax and straighten herself out like never before. That being said I want to state again that I do not think that the Stem cells themselves are doing anything in my daughters body that has not been directed by God! I think that there is nothing in our body that is put there on accident. I believe that those Cells are there for a reason! I think God gave us different gifts and having the intelligence of a doctor and be able to figure this out is also from God! God is finishing what man can not! 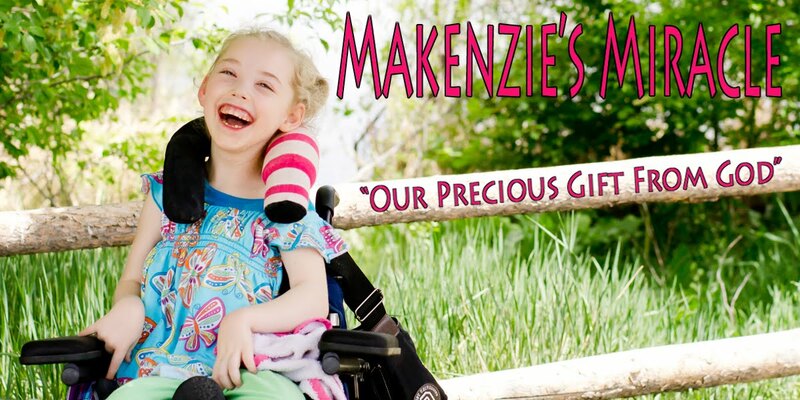 Please continue to pray for Makenzie! Pray for those Cells to continue to live in her body and go where they need to go! Also please pray for our family as this journey is long and sometimes very overwhelming! It has been a great day but also long and trying! Satan can try to try to place doubt and fear in my heart but with God's protection and grace I will not be afraid! I will stand still and know that the Lord will rescue me TODAY!!! OMG! I am so excited for you - these are terrific new signs of many great things to come. She's doing so great!